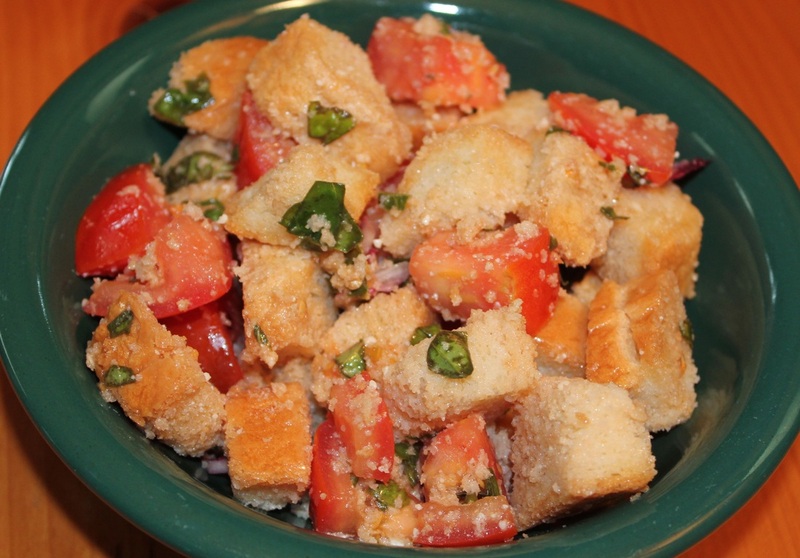 Panzanella is a great way to use your left over French bread. It is the epitome of summer with the tastes of basil and ripe tomatoes. Panzanella doesn't work with regular sliced bread, so don't even try to make this salad unless you have some crusty bread on hand. I love this version of Italian Bread Salad from "The New Mediterranean Diet Cookbook" by Nancy Harmon Jenkins because of the addition of the balsamic vinegar. Cut bread into 1/2-inch cubes. Discard any end pieces. Place bread, tomatoes, onion and basil into a large salad bowl. Pour dressing over salad, mixing well. Cover and let the salad sit out for about 30 minutes to allow the flavorful dressing to seep into the bread and soften it.